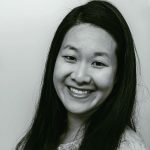 Published Aug 20, 2017 By Julia 2 CommentsThis post may contain affiliate links. 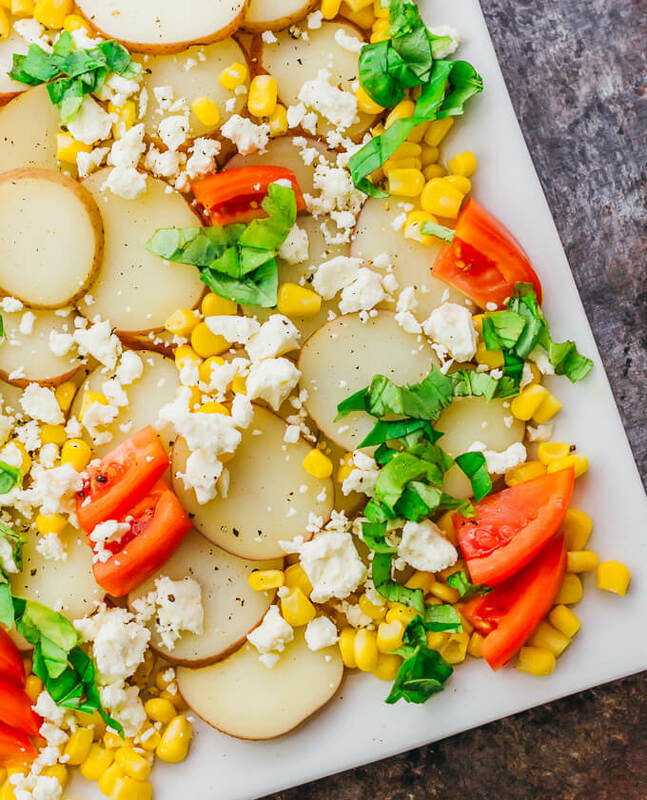 Tossed with a balsamic horseradish dressing, this easy-to-make and flavorful potato salad has sliced red potatoes, corn, feta cheese, tomatoes, and basil leaves. I’ve been making and eating a lot of potato salads this summer. 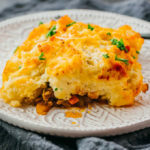 Hands down, this one is definitely my favorite, because it is the farthest thing from bland that you can get and the dressing doesn’t involve mayonnaise or yogurt. Usually, I balk at potato salads that are overly laden with mayo because I feel like all I’m tasting is mayo. Same goes for yogurt based dressings. 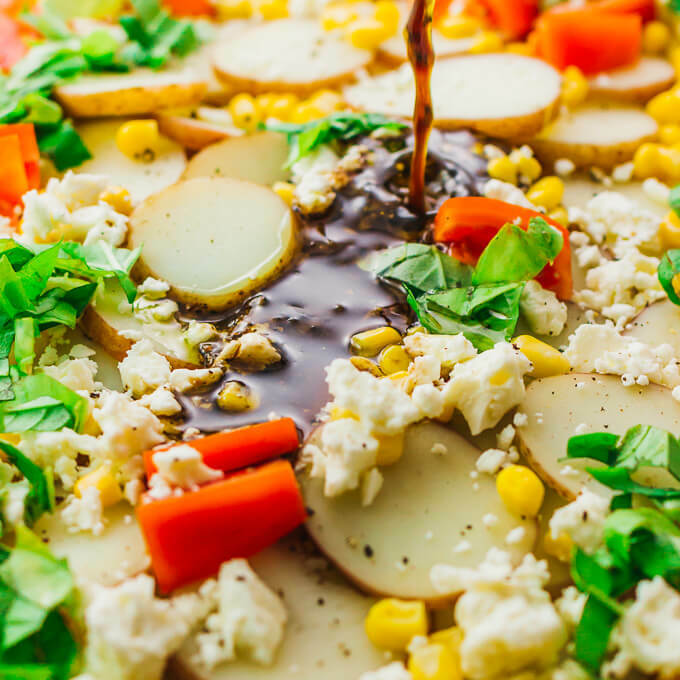 That’s why I love how this potato salad has a dairy-free dressing with strong balsamic and horseradish flavors. This is also the easiest potato salad that I’ve made all summer. 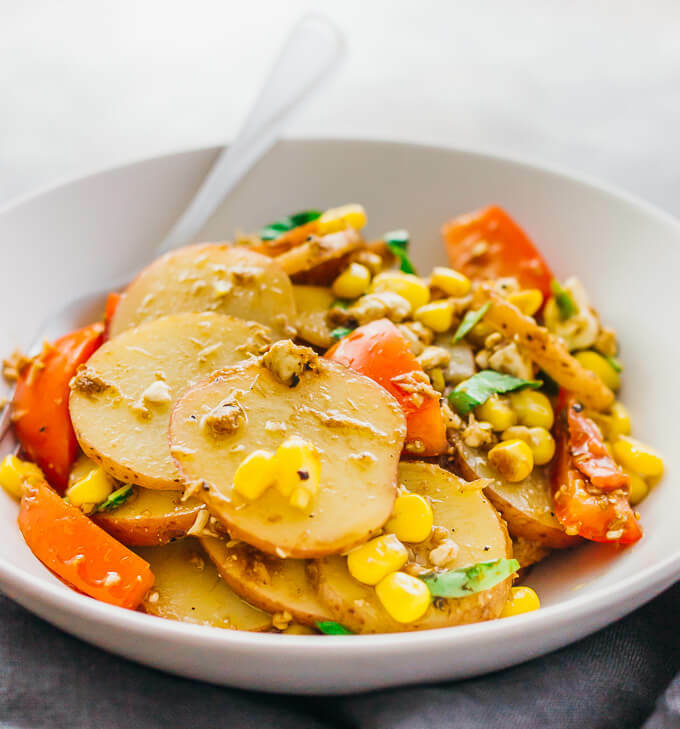 All you need to do is boil the potatoes in a pot until tender, which only takes about 5 minutes because they’re sliced thinly, and then combine all of the ingredients together to toss with the dressing. 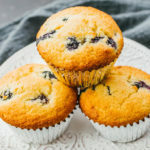 So simple and tastes fabulous. 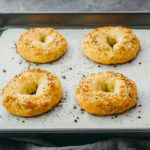 This recipe is slightly adapted from a version made by Mr. Savory Tooth’s mom — mainly, I modified the dressing by adding a generous amount of prepared horseradish for a little extra zing. If you haven’t used horseradish before, you can find it in the refrigerated condiment section of your supermarket. It’s called prepared horseradish because the white root of the horseradish plant has been grated and mixed with vinegar. It will usually last for several months in the refrigerator before losing its flavor. Don’t confuse it with horseradish sauce, which is a milder and creamier mixture of grated horseradish with cream, sour cream, or mayonnaise. Also, some people get horseradish confused with wasabi. They’re actually different plants, but nowadays most wasabi condiments are actually made using horseradish because wasabi plants are scarce. If you know any sushi lovers, chances are they’ve never actually eaten real wasabi. The toppings in this recipe can be easily substituted with your favorite potato salad fixings. 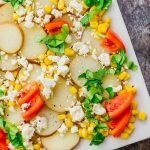 I used corn, tomatoes, basil, and feta for a fresh and summery feel, but you can absolutely substitute with more traditional potato salad ingredients such as cucumbers, egg, bacon, or ham. 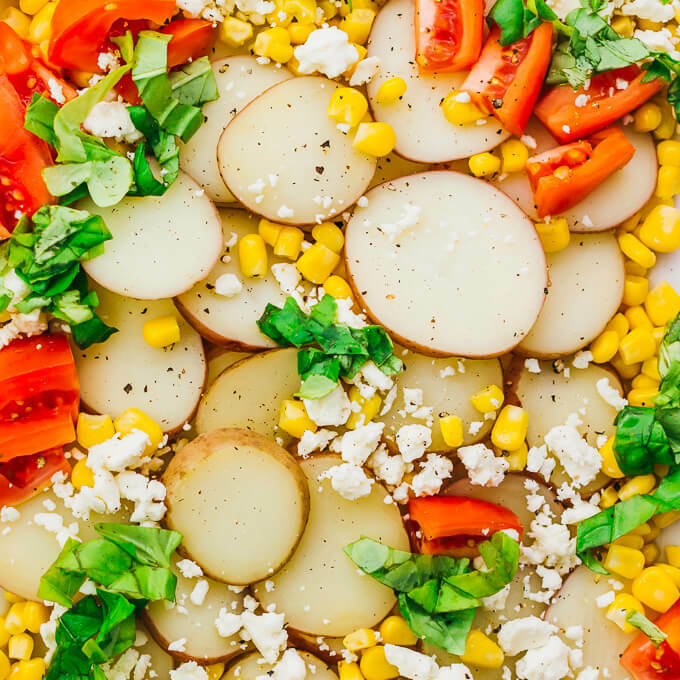 If you’re making this potato salad ahead of time, I would recommend storing the cooked potatoes and toppings separate from the dressing in the refrigerator. Just prior to serving, stir the dressing and toss with the potatoes and toppings. For more side dish ideas that you can bring to a potluck and make ahead of time, check out my Southwest couscous salad, bacon broccoli salad with cranberries, and Greek salad with avocado dressing. 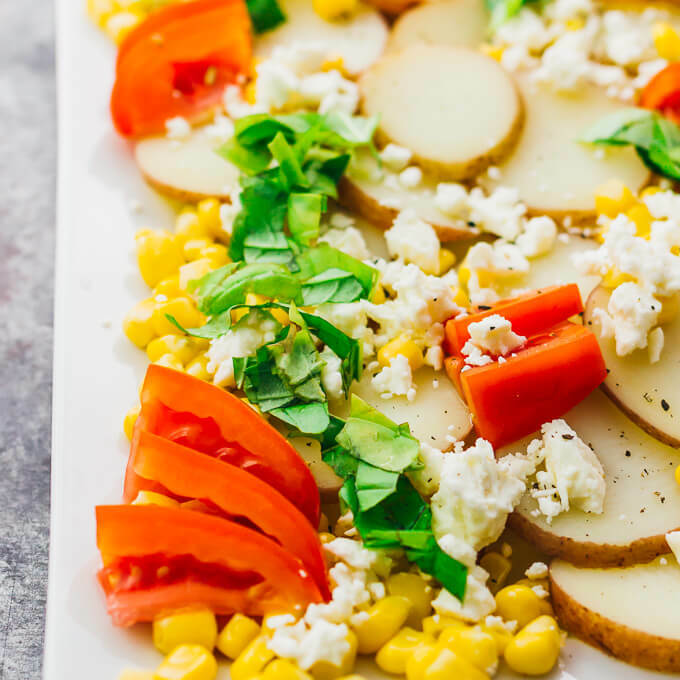 Drizzled with a balsamic horseradish dressing, this flavorful potato salad has sliced red potatoes, corn, feta cheese, tomatoes, and basil leaves. Boil sliced red potatoes until tender, about 5 to 10 minutes. Drain the potatoes and let cool. To cool faster, rinse with cold water for several minutes. Add cooled potatoes and all toppings to a large mixing bowl. Add all dressing ingredients to a small bowl and whisk until combined. Pour over the potatoes and toppings. Toss until well-mixed. Refrigerate until ready to serve. Beautiful photos! Your version sounds interesting. However, I might try it with a little less horseradish. ?